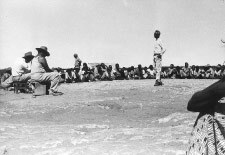 On 1 May 1946, nearly 800 Indigenous pastoral workers throughout the Pilbara defied the Aborigines Act 1905 (WA) and walked off in protest over lack of personal freedom, poor pay (often only rations) and sub-standard living conditions. Under the Act, pastoralists were granted permits to employ Indigenous workers, who were then not legally able to leave the station, nor travel below the 20th parallel, without a permit. Vast fortunes were built on this virtually captive, largely unpaid workforce. A six-week meeting of 200 Indigenous Lawmen in 1942 had reached consensus about striking, but action was deferred until after the Second World War. Then the Pilbara Strike was meticulously organised by Nyamal man Clancy McKenna, Nyangumarta man Dooley Bin Bin, Nyamal man Peter Kangkushot Coppin and Don McLeod, who police reports called a ‘white stirrer’. Stockmen, gardeners and house servants walked off pastoral stations throughout the Pilbara. Ernie Mitchell with Peter Coppin listening to arguments for and against ‘the split’ of the company Pindan Pty Ltd, 1959. Despite constant harassment the strikers sustained themselves yandying (a method of surface mining) for tin, and trading skins and pearl shells. After three years their determination and tenacity were rewarded with improvements to pay and conditions for Indigenous people. But many never returned to work for the ‘whitefella’. The dream of economic independence was eventually realised. The successful cottage industries they established, especially the profitable mining concerns, built self-reliance and confidence. The Group, as they became known, registered the first Indigenous-owned company in Western Australia in 1951, and went on to own several pastoral stations.